Monday September 16th 1895 We had early breakfast and got the folks started home. Oliver helped me wash and I ironed part of the things in the afternoon. After early supper we went down town. Will did not come and we went and brought Mother out to stay all night. Weather warm. Tuesday September 17th 1895 Mother and I finished the ironing and got up a few apples before noon. We took Mothers pickles home in the afternoon I got a letter from Will. Mother did not come back I got supper early and Oliver took me down to the depot Will came, he has had a nice visit. 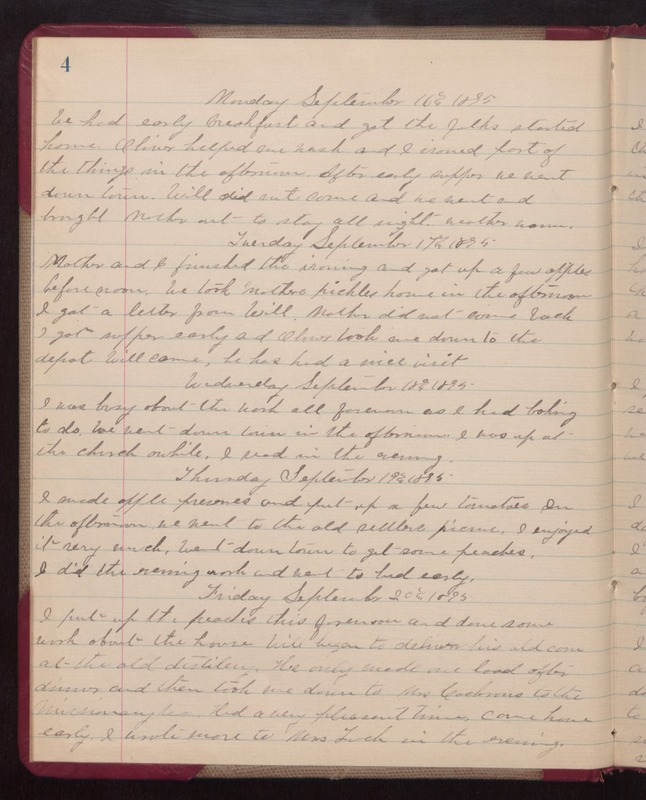 Wednesday September 18th 1895 I was busy about the work all forenoon as I had baking to do. We went down town in the afternoon. I was up at the church awhile. I read in the evening. Thursday September 19th 1895 I made apple preserves and put up a few tomatoes In the afternoon we went to the Old Settlers picnic. I enjoyed it very much. Went down town to get some peaches. I did the evening work and went to bed early. Friday September 20th 1895 I put up the peaches this forenoon and done some work about the house Will began to deliver his old corn at the old distillery. He only made one load after dinner and then took me down to Mrs Cochrans to the Missionary tea. Had a very pleasant time, came home early. I wrote more to Mrs. Luck in the evening.